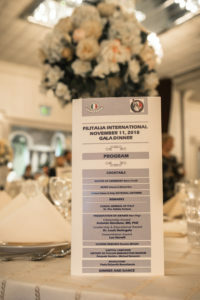 Philadelphia, Pennsylvania, United States of America (Sunday, November 11, 2018) – The Thirty First annual dinner of the Filitalia International (FI) Gala had taken place at Celebrations Banquet hall, in Bensalem, PA from 4:30pm to 10:30pm on Sunday November 11 th , 2018. The Master of Ceremony of the Gala evening was Marco Circelli, the Executive Director of FI, which had remember to tell those present that the organization celebrates 31 years of the founding, under the continuous guide of the President Emeritus and Founder, Pasquale Nestico. 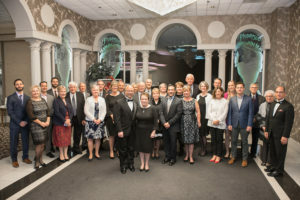 Paula DeSantics-Bonavitacola, first Vice President of FI had thanked all the participants and volunteers that have contributed to the realization and achievement of the unforgettable night for the number of guests (over 260) and the contribution of numerous sponsors. The Console General of Italy, Dr. Pier Attinio Forlano had sent a message in which he recognizes the historical and consolidated role of FI in the Consul’s district of Philadelphia and applauds to the initiatives and to the conferring awards to distinguished Italian and Italian-American personalities who live and work in the city of Philadelphia and surrounding locations. The President of FI Marc Virga spoke recent events that have garnered negativity towards the History of Italian Immigration Museum. He wished that the new generations of Italian Americans will always be involved in activities to defend Italian culture, tradition andlanguage in the United States of America. The objective of FI is to continue to grow thanks to the help of sponsors and donors who believe in the associative mission and want to contribute to the maintenance of identity roots, both in the Greater Philadelphia area and throughout the world. 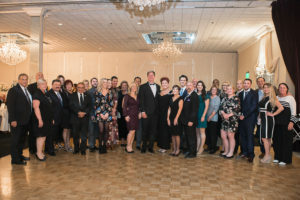 The following awards were presented to important exponents of the Italian-American community in the Greater Philadelphia area. The first award, the “Citizenship Award” was conferred to Dr. Prof. Antonio Giordano, Founder and President of Sbarro Health Research Organization at the Temple University of Philadelphia, who reminded all the guests that the priority objective for the Italian-American community is to invest in the education sector at all levels and in all fields, such as scientific and technological subjects. The second award, the “Leadership & Educational Award” was given to Dr. Louis DeAngelo, Superintendent of the Catholic Schools in the Archdiocese of Wilmington Delaware. Thank to the personal story of Dr. DeAngelo. The Dr. had explained how the values inherited from his family of Italian origin (grandmother was originally of Cosenza, Calabria) had influenced greatly his life and delineated his professional success as an educator and inspiration of all teachers close to him. The third award, “Humanitarian Award” was given to Leonard “Lee” Norelli, National President of UNICO, a philanthropic organization that assists citizens that need help in United States of America. Norelli had recognized the public importance of Filitalia International and had specified how important it is for these associations to defend and continue to defend Italian culture and identity among various sections of the population. 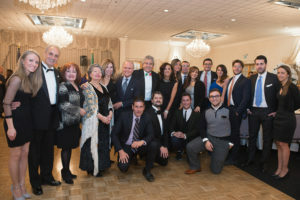 The Past Previous President Rosetta Miriello had spoken of the of the passing of Filitalia and listed all the goals achieved by FI during the 30 years of activity, through the creation of the chapters, both domestic and foreign, the institution of the History of Italian Immigration Museum and the recent appointment of Ente Gestore from the Consul General of Italy in Philadelphia. Miriello has endlessly publically recognized Dr. Nestico for his continuous support and inspiration towards FI, which has been able to grow thanks to its perpetual operations. The Founder and President Emeritus, Dr. Pasquale Nestico wanted to remind the importance of the social and cultural scope of FI, and has reminded the present guests how important it is to preserve the Italian identity, also through donations to the Capital Campaign (fundraising) for the expansion of the FI Museum. “Our annual Gala continues and makes an unforgettable and unmissable appointment in our Italian-American community in the Greater Philadelphia area – said Dr. Pasquale Nestico, founder and president emeritus of FI – and we are proud to have created a solid and perpetual tradition in these 31 years of life, with the objective of preserving and cultivating our roots, our traditions, and our culture together with all fellow countrymen and sympathizers”.